This is a Pre-Cut Brute Bash Armor White Body for PRO-MT 4x4 & Stampede 4x4. 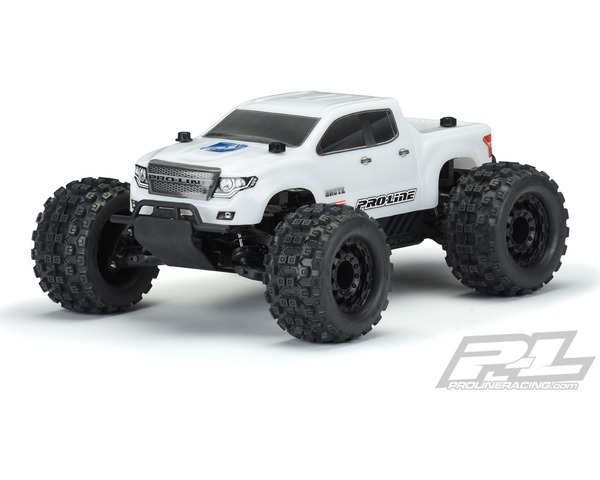 Pro-Line has developed the Ultimate Bash body for your PRO-MT 4x4 & Stampede 4x4 the pre-cut Brute body featuring Pro-Line's all-new Bash Armor material! If you are like us, you want a dependable high strength body you can count on for your truck. The Brute Bash Armor White Body has been developed from the ground up to be the toughest body Pro-Line has ever produced. The all-new Bash Armor material is twice as thick as regular 1:10 truck bodies and is ultra-flexible to reduce the chance of cracking and shattering. Unlike clear polycarbonate, the Bash Armor material is White and is not paintable, so Pro-Line includes detailed decal sheets to complete the look. The Brute is Pro-Line's take on a modern truck and features a bold grill with eye-pleasing body lines sure to turn heads at your local bash spot. If you are ready to battle your buddies, then get the strongest body possible for your truck - the Pre-Cut Brute body with Bash Armor material technology! The Bash Armor material can NOT be painted. Pro-Line does encourage the use of stickers or wraps to customize the look of your Bash Armor body.